Most homebrewers learn how to achieve a workable crush by trial and error. They may start by reading descriptions of how crushed malt should look like. (For example, it should contain X% big pieces of husk, Y% small pieces of endosperm (coarse grits) and Z% fine grits and flour. About a third of each is one standard description.) They may look at pictures in a book or magazine of properly crushed malt and then proceed to experiment on their own, crushing progressively more finely to get better extract efficiency and stopping when they encounter lautering problems. While the trial and error methods works in practice — at least eventually — there is an objectively way measure your mill output before mashing. This would allow you to fine tune your crush before mashing the grains, including when you switch mills or mill grains that require a mill gap adjustment. The method involves sifting the mill output through a series of sieves and weighing the amount of material retained on each sieve. Sieves come in a variety mesh sizes as described by the US Standard Sieve series. Sieves are commonly either brass or stainless steel, with brass being cheaper. They come in a variety of diameters, with 8 inches being the preferred size for malt analysis. They also come in full height and half height versions, with half height being proscribed by the ASBC (American Society of Brewing Chemists) for malt analysis. For malt analysis, the most common set of sieves is #14, #30 and #60. 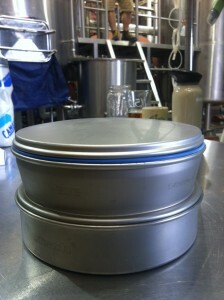 You would also need a pan to go under the stack of sieves and a cap to cover them. The #14 sieve would retain husk pieces, but let the grits and flour fall through. 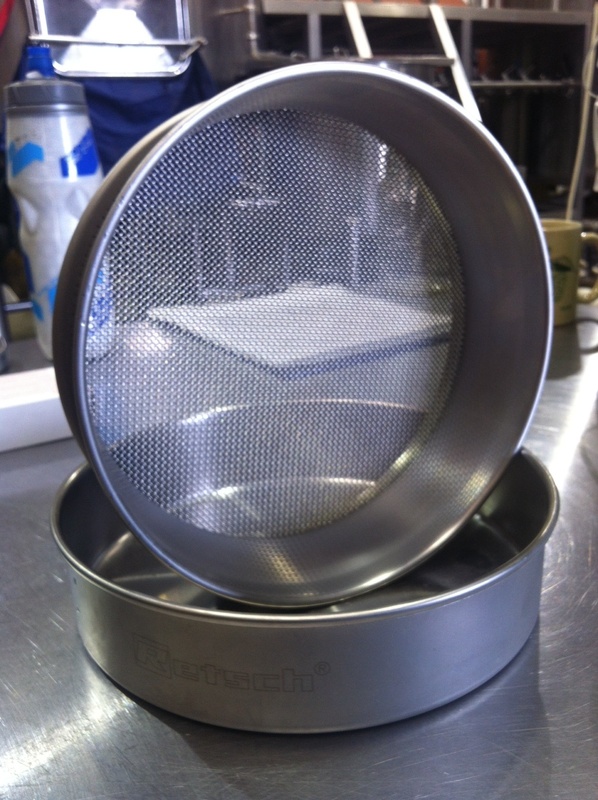 The #30 sieve would retain coarse grits while the #60 would retain the fine grits. Flour would fall through all the sieves and land in the pan. Large breweries may employ a larger set of sieves — #10, #14, #18, #30, #60 and #100. Briggs, Hough, Stevens and Young, in their “Malting And Brewing Science: Volume 1” (1971, Kluwer) additionally give a series of Pfungstadt Plansifter sieves numbered 1 through 5 that have roughly the same mesh size as the #14, #18, #30, #60 and #100 sieves. To test your mill output, collect about a cup of malt as it falls from the mill. Don’t scoop a cup out from a pile of milled malt as the smaller pieces will have already settled — sample your malt from the “stream” coming from the mill. Weigh each of the sieves, and the pan, when they are empty. Stack the sieves in a series progressing from the coarsest sieve on top to the finest on the bottom, and the pan underneath them. Pour the milled malt on the top sieve and add the cap. Shake the assembly for 3 minutes, rapping the whole thing on a hard surface a few times each minute. (Large breweries have dedicated mechanical shakers for this.) After the shaking, weigh each sieve again and subtract the weight of the empty sieve to get the weight of the malt retained on each. Do this for the pan as well. Divide the weight of the malt in each sieve by the sum of all their weights to get the percentage weight retained on each screen and in the pan. Record these numbers to compare with later testing. The most important thing for a homebrewer to do is test his mill output, calculate the extract efficiency for each batch tested and make note of any lautering problems. You should pretty quickly be able to build an objective measure of what your mill is putting out and how it performs in your brewhouse. If you want to try to improve upon your extract efficiency, but still have big husk pieces to help with lauterability, try malt conditioning. This article will aassist the internet users for seetting up new web sute or even a weblog from start tto end. .. I’ll bookmkark your website and take the feeds also? i do not know which sieve will be suitable . we are a factory running biscuits then we rework the broken ones so we are having a problem of plastics and other foreign objects ending into the product .we want to sieve four when we through it in the mixer machine the sieve must be on top of mixer .